Trump’s Tax Plan Raises Taxes on Single Parents. His Campaign’s Examples Prove It. Donald Trump seems to have a grudge against single parents. His maternity leave proposal might exclude some single mothers. And a new study by New York University Law Professor Lily Batchelder found that Trump would raise taxes on at least 7.8 million families, including the majority of single parents. Perhaps this is why Trump uses examples with married couples when discussing his tax plan. Even Trump’s example families would pay higher taxes under Trump’s plan, if those families were headed by a single parent instead of a married couple. These tax increases are larger than the tax cuts received by the married couples in Trump’s examples. Comparing Trump’s tax plan to the current tax system, Trump raises taxes on single parents in three ways: eliminating the head of household filing status, eliminating personal exemptions, and raising the tax rate in the lowest tax bracket from 10 percent to 12 percent. To illustrate how his tax plan would work, Trump uses two example families, both of which are headed by married couples with two children. One of these families makes $50,000 per year and has $8,000 in child care expenses. The other family makes $75,000 per year and has $10,000 in child care expenses. The family making $50,000 would get a tax cut of $93, and the family making $75,000 would get a tax cut of $1,083. If Trump gets his way, the wealthiest Americans would see much larger tax cuts, according to an analysis by the conservative Tax Foundation. At the same time, Trump’s tax plan would make huge spending cuts to affordable housing, education, and even health care for veterans. Yet even with such a large overall tax cut that would undermine health care, retirement security, and other middle-class programs, Trump would still raise taxes on most single parents. 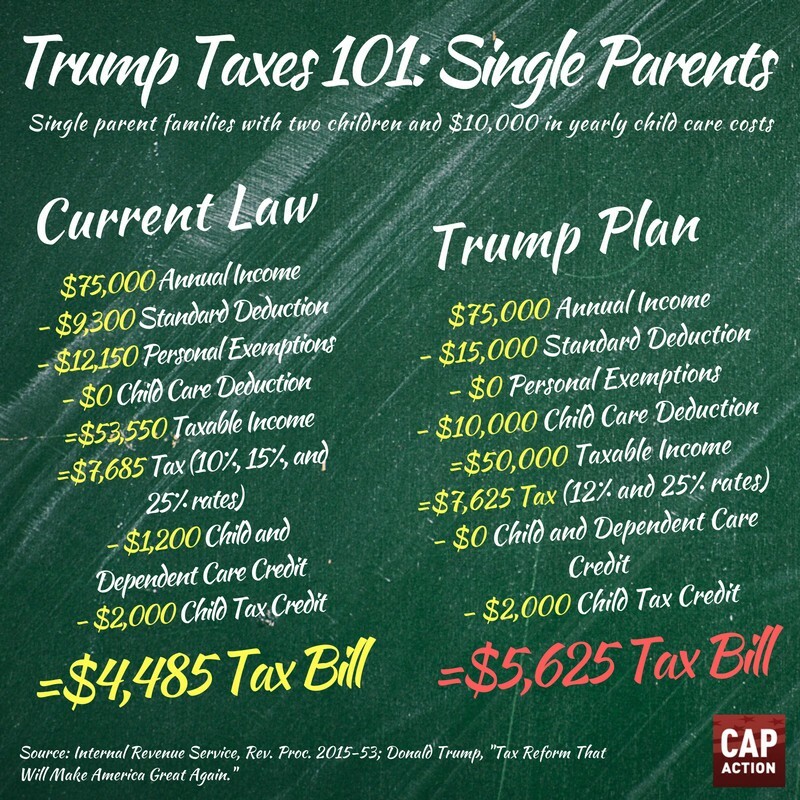 A single parent with a $50,000 income, two children, and $8,000 in child care expenses — the same as Trump’s example but with a single parent — would get a $340 tax increase. If their income was $75,000 and their child care expenses were $10,000, Trump would raise their taxes by $1,140. The Trump campaign claims that Batchelder’s study is “invalid,” because it does not include the possibility that families will receive a $500 matching contribution from the federal government for using Trump’s proposed Dependent Care Savings Accounts. However, Trump’s own numbers using the sample families examined here also did not include any government match from these accounts. The Tax Foundation also did not include Dependent Care Savings Accounts in its analysis of Trump’s tax plan, but instead of calling this analysis invalid, the Trump campaign touted the Tax Foundation’s findings — even after criticizing the Batchelder study. If the Tax Foundation had included this provision in its analysis, it would have further increased the already massive cost of Trump’s tax plan. The Trump campaign says that the government matching contribution is for “low-income families,” but has not made clear whether a family income of $50,000 or $75,000 qualifies as low-income. Even if the single parent with a $75,000 income received a $500 match for both children, Trump’s plan would still raise their taxes by $140. The Trump campaign now says that Trump would tell Congress not to raise taxes on any low- and middle-income Americans — even though his own tax plan says otherwise. In other words, Trump is saying “believe me” to some of the same working families that have already been victimized by Trump’s scams and broken promises. We already know how Trump University instructed its salespeople to prey on the financial insecurity of single parents to pressure them into paying for a high-priced scam. Now Trump’s tax plan would make these same single parents even less financially secure.